Lenovo YOGA 3 Pro 13.3"QHD+Thinnest Convertible Laptop Core M 5Y70 8GB 256GB SSD. Note : Comes in Orange Colour, Images and Videos are only for illustration purposes only. Please refer to technical specs for exact model and details. The Lenovo YOGA 3 Pro is just 12.8 mm thin with a 'watchband' hinge hand-assembled from 813 individual pieces of aluminium and steel, allowing it to lie flat when opened 180 degrees. As thin as a pencil, this slim device is flexible enough to adapt to any situation. The Lenovo YOGA 3 Pro is designed to be exceptionally thin and light, yet intelligent, with a watchband hinge design and intuitive software that responds to how you use it. Whether for work or play, YOGA adapts to you with four different modes: Work, Chat, Watch or Read. Laptop is the classic experience for notebook PCs. With YOGA Pro 3's integrated keyboard and touchpad, its easy to do a range of productive activities. Harmony adapts to you by intuitively optimising settings, making app recommendations by mode and sharing statistics about how you use the device. 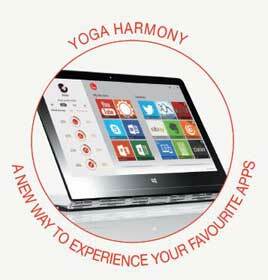 Harmony also knows which apps you use in which YOGA mode, making frequently used apps easier to find based on the YOGA mode. Trending recommends new apps based on what YOGA owners are actually using in that particular mode. 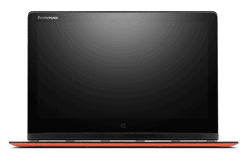 Lenovo YOGA 3 Pro has a super high-resolution QHD+ Touchscreen display, with wide view angle IPS technology. The low-power display reduces power consumption and improves battery life. Gorilla Glass protects the screen while providing crystal clear visuals. JBL Stereo speakers bring immersive sound when playing music, gaming or watching videos. Not only does JBL bring professional level sound to YOGA, Waves Audio certification places studio-class post sound production at your fingertips. Dragon Assistant is the conversational personal assistant for your computer, designed for Intel RealSense technology. With Dragon Assistant, enjoy the convenience and freedom of using your voice to control a device in an easy, intuitive dialogue. Just tell it to find content, get answers, play music, connect with friends, and more. It works seamlessly with many popular desktop applications and websites, and has a very friendly disposition. Its natural language understanding turns speech into action for a whole new interactive conversation. The YOGA 3 Pro can be equipped with A/C WiFi, which offers up to three times the connection speeds of 802.11n. 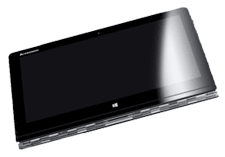 The Lenovo YOGA 3 Pro has a battery power of up to 9 hours, courtesy of its built-in 44 Whr Li-Polymer battery. This lets you take your YOGA out to a coffee shop, business meeting or friends house without fear of running out of power for up to 9 hours. The Lenovo YOGA 3 Pro features the energy-efficient Intel Core M Processor for long-lasting battery life. Ultra-fast PC processing power for highly mobile devices.